A new defense always comes with a transitional period. Nebraska just went through one of those a few years ago when Mike Riley and his staff took over in Lincoln. Now, the Huskers are going through another adjustment period under new defensive coordinator Bob Diaco, and the scheme shift from a 4-3 to a 3-4 has only magnified the work the coaches and players need to do. Spring ball was the introduction to Diaco’s system, and two weeks into fall camp, Nebraska is still in the evaluation period. A big part of “focusing on themselves” is determining which positions players belong at in this new scheme. Outside linebacker or defensive end? Defensive end or nose tackle? Safety or cornerback? Those are the decisions the coaches are making as camp rolls on, and they don’t always get it right on their first try. Several players have already changed positions during camp, with many of them coming within the front seven. Freedom Akinmoladun and Carlos Davis will start at the defensive end spots with Mick Stoltenberg lining up at the nose, but the spots behind them are still in flux. Peyton Newell worked at end behind Carlos Davis in the spring, but the coaches moved him inside to the nose. Newell has been running primarily with the second unit, but the coaches are limiting Stoltenberg’s practice reps somewhat, giving Newell the chance to see some time with — and against — the starters, including one of his friends on the offensive line. “Cole Conrad’s my roommate, so it’s fun messing around with him and then when we get home, Nick Gates and him are in my ear about different stuff and it’s a lot of fun, a lot of trash talking,” Newell said. Newell is up to 298 pounds after playing at 290 in the spring, and all of his snaps are coming at the nose. Newell, a junior, said he is excited to make the transition. With Newell’s move inside, the coaches slid Khalil Davis outside to work behind his brother at end, although he said he’s still getting some reps on the interior. Davis said he’s most comfortable at the nose because of his experience in the previous scheme. Ben Stille, who had been working at outside linebacker, has moved up front to add depth at the field side defensive end spot as well. Don’t count out the true freshmen in the discussion for playing time. Damion Daniels and Deontre Thomas have both made an early impression. Inquisitiveness is a good trait to have for an athlete trying to make the leap to college sports, and both Thomas and Daniels seem to have that in spades. Whether or not they see the field or redshirt this season will not be determined for some time yet, but the early reviews from Diaco are positive. 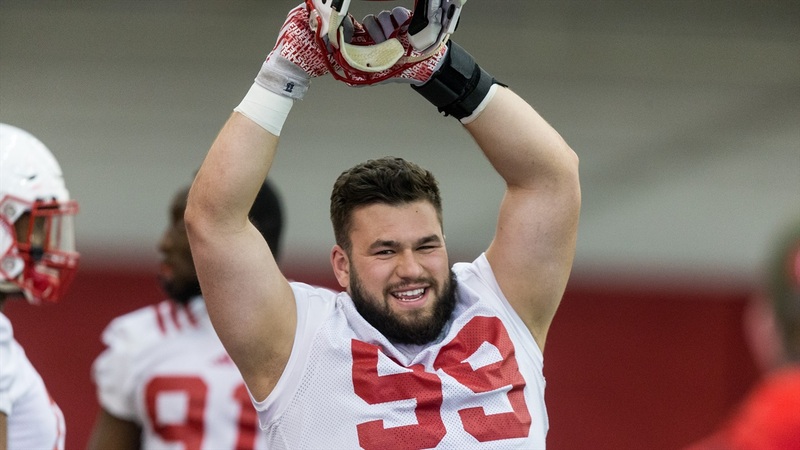 Thomas in particular got a lot of quality reps in Thursday’s open practice, working with the group of linemen that included the starters and primary backups during position drills. Nebraska has its starters established on the defensive front, but Diaco has said that a lot of players are going to get the chance to see the field in his defense. The rest of camp is about determining which of those reserves are ready to step forward and play an active role.